Hello Friends! All the Job aspirants of Madhya Pradesh will be glad to know that Jail Prahari vacancies are to be filled in the state. The department is conducting MP Jail Prahari Bharti 2018. In this article, we are discussing all about Jail Prahari Recruitment in MP. We are sharing the important dates, Online Application Form Filling Process. Using the given steps, you can even download the Official Notification of MP Jail Prahari 2018 as PDF File. Let’s get Started. 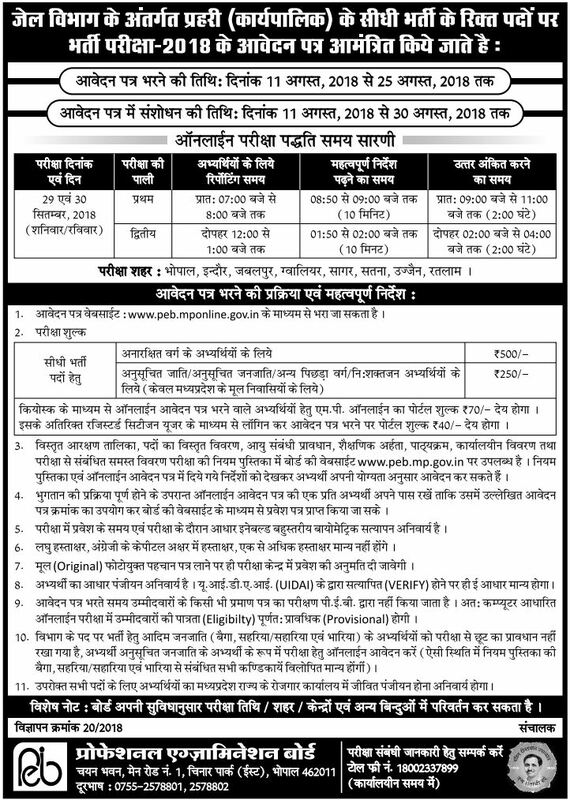 All the and eligible candidates must apply online for Jail Prahari vacancy in Madhya Pradesh. All the Interested candidates are advised to download the Official Notification and Study it carefully before applying. The Official Notification contains all the important instructions and information regarding the MP Jail Prahari Bharti 2018.